Stig Regan goes up for a block. Diego Garcia hits a ball back over the net. It's nearly impossible to escape the sound of pedestrian noise and car horns in the heart of Emerson's campus. Diego Garcia thinks people lean on their horns too often. Life is quieter in the home of Garcia and his men’s volleyball teammate, Stig Regan. Both are from Hawaii—over 5,000 miles away. Regan is from Kailua, O’ahu, and Garcia is from Honolulu. Regan, a visual and media arts major, said it is largely a coincidence that both he and Garcia come from Hawaii. 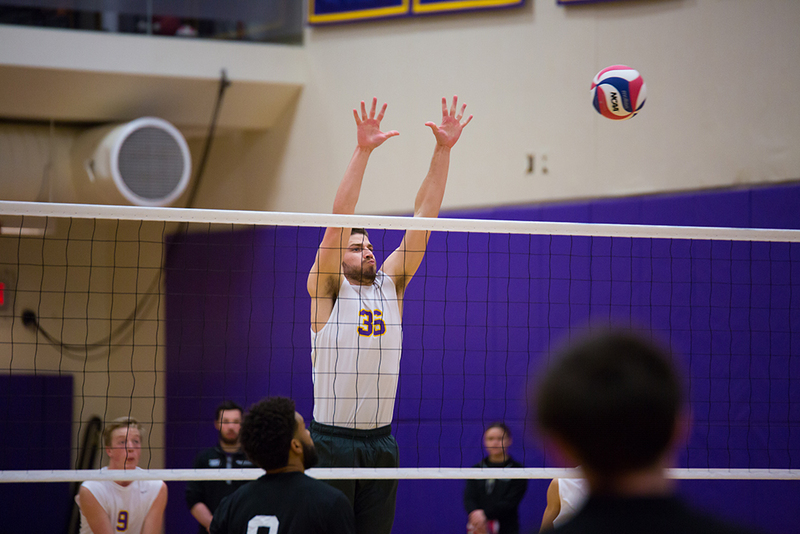 Regan said that once he applied to the school, head coach Ben Read reached out to him about playing for the volleyball team. Garcia said his recruitment process was similar to Regan’s, though he was not sure he wanted to play volleyball in college. Garcia said he was encouraged to play for Emerson because of the team’s Division III status. Garcia grew up in California and moved to Hawaii at age 10. He was first introduced to volleyball, one of Hawaii’s most popular sports, in the seventh grade. Garcia said Read notified him the team featured an upperclassmen from Hawaii, Regan, before he arrived at Emerson. Regan said he was excited when he heard another Hawaiian was joining the team. “I didn’t know him while I was in Hawaii, because he went to school on the other side of the island,” Regan said. “We have mutual friends." In his freshman season, Garcia has provided depth on the attack with 118 total attacks and 46 kills, third most on the Lions roster. Regan, one of the team’s co-captains, leads the team with 19 blocks. Garcia said life in Boston is fast-paced, but living in a college town gives him a lot more to explore than in Hawaii. Despite the major climate disparities between the 50th state and the city that started the American Revolution, Garcia said it would be hard to choose one over the other. “Education wise, I have to say Boston. But for living, it’s Hawaii,” Garcia said.